We’re getting our menu ready for Cinco de Mayo, and these Chicken Enchiladas with White Sauce are up first! 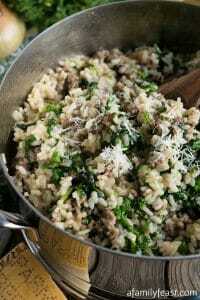 This easy to prepare meal is always a hit with our family and we’re sure your family will love this too! 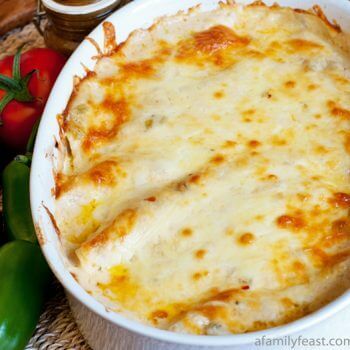 This recipe for chicken enchiladas with a creamy white sauce uses our popular Mexican pulled chicken recipe – a versatile, easy and delicious way to prepare chicken for many Mexican-inspired recipes such as this one. 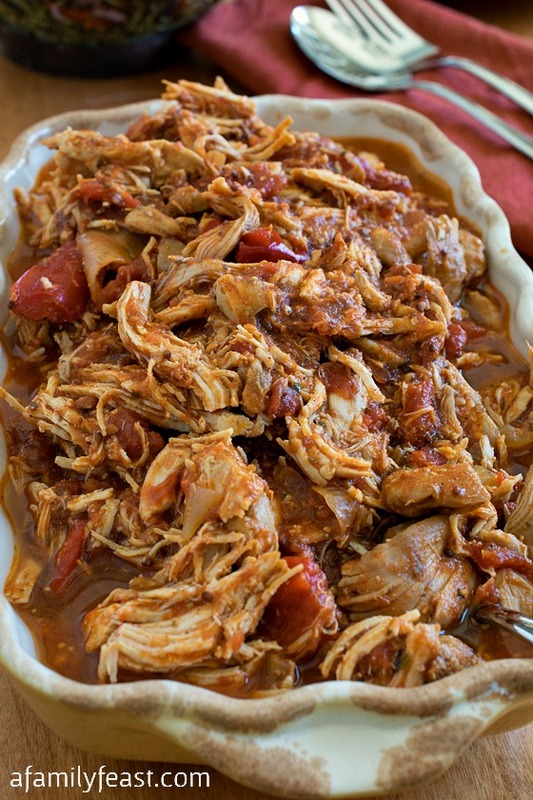 The Mexican pulled chicken is perfectly flavored with a spicy blend of tomato and peppers as well as other seasonings, and it’s cooked until fork-tender and then shredded. And, as you can tell by the name of this recipe, our version of chicken enchiladas uses a white sauce that has the perfect hint of heat rather than the more traditional red enchilada sauce. 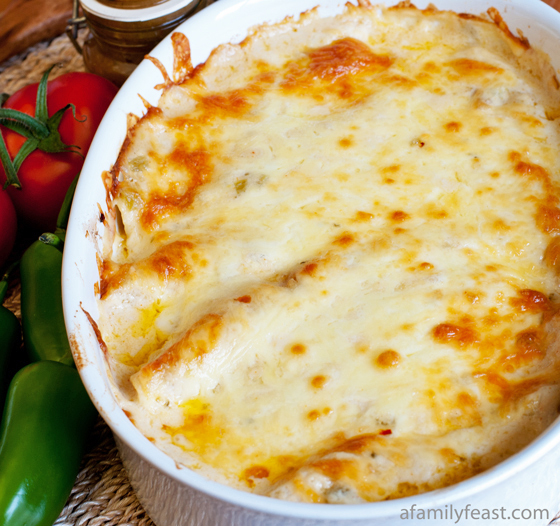 But while our family prefers a creamy white sauce for this dish, you can easily substitute red sauce instead and these chicken enchiladas will still be delicious! 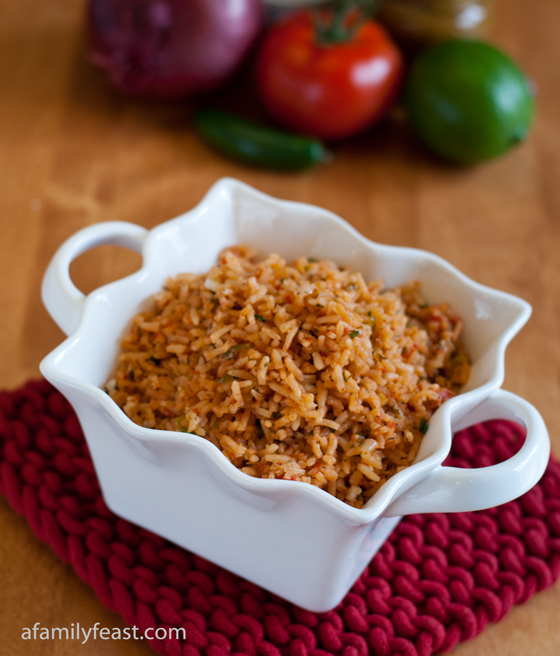 This dish is delicious served with our Mexican Rice and Refried Beans. In a medium sauce pan over medium heat, melt butter and add flour. Stir and cook for 3-5 minutes or until the raw flour smell is gone. Add heated chicken stock 1/3 at a time, stirring with a wire whisk for each third. (This step will ensure no lumps in your white sauce.) Add cayenne and stir again. Add sour cream, salt, chilies and Rocket Fuel and stir. If you like it spicy, use more Rocket Fuel. Remove from heat and hold. 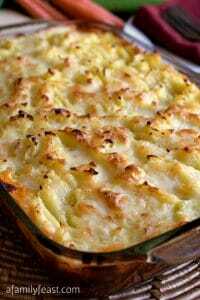 In an 8×10-inch casserole dish or glass baking dish, coat the bottom with a ladle full of white sauce. Lay tortillas flat on your cutting board or counter and divide the Mexican Pulled Chicken and Pepper Jack cheese between all six and roll each one tight. Place each roll, seam side down, in the sauce lying side by side. Bake for 40 minutes. Let set for 10 minutes before serving. Made this for Christmas Eve dinner with dairy free cheese and sour cream and holy moly was it delicious! Thank you for this awesome recipe! You’re very welcome Heather! Merry Christmas! I’ve got this on the oven right now. We’re very eager to try it! I noticed that there’s a step missing in the directions. At step 8, you say to lay the rolled up tortilla in the sauce, but you never mentioned putting the sauce in the baking dish (or how much). Otherwise, this was a very easy recipe to follow and I can’t wait to try it! Hi Leila – Hope you love the enchiladas. 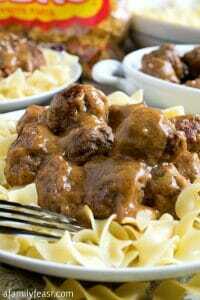 See Step #5 – we suggest placing about a ladle full of sauce in the bottom of the casserole dish. 🙂 Hope that helps! I need you to put out a book or is there one and I missed it? 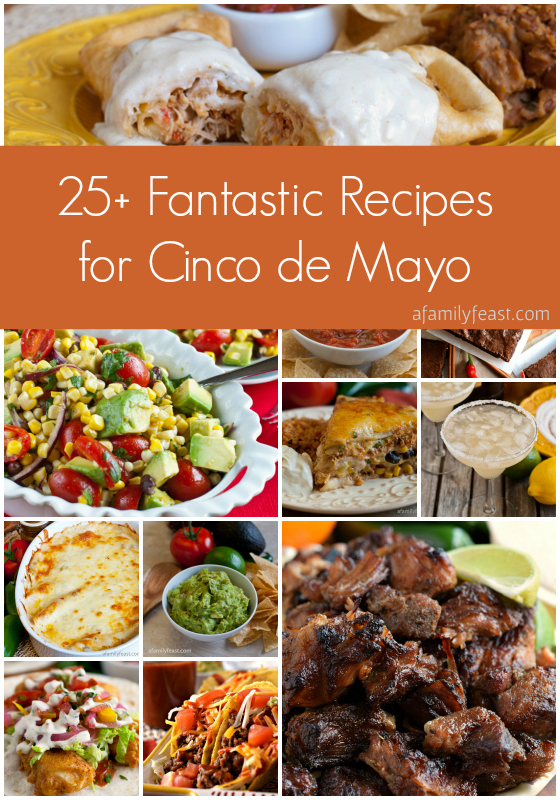 So many recipes to try and so little time! Hi – we just heat it in the microwave or in a pan on the stove! It is our family tradition to have enchiladas on Christmas Eve. This year I used your recipe for both the shredded chicken and enchiladas; and everyone LOVED it! I’ve never fried the tortillas before rolling, but the technique worked perfectly for easy tight rolling. 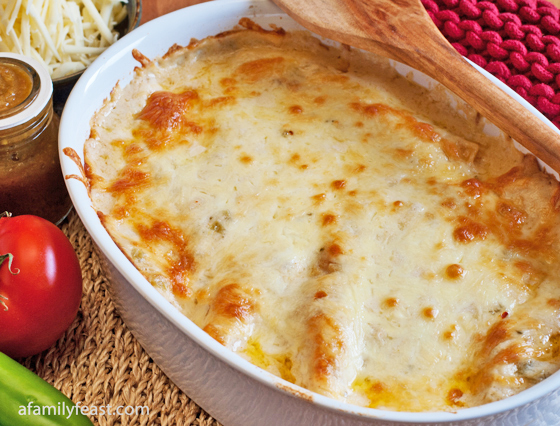 Definitely our new go-to enchilada recipe- the white sauce and chicken combo are my favorite! Thanks so much for the recipe! Wow Lindsey – you sound like an enchiladas expert 🙂 and we are hugely flattered that our recipe has made the list. Thank you for taking the time to write to us – you’ve made our day! Wow, this is some of the best food I’ve ever eaten … but I guess I can say that about most of your recipes we’ve tried! Thanks! Awww…thank you so much Rick! We’re very glad you’re enjoying this and all of the other recipes! Thanks for taking the time to write to us today! Hi Marlen – Great question. 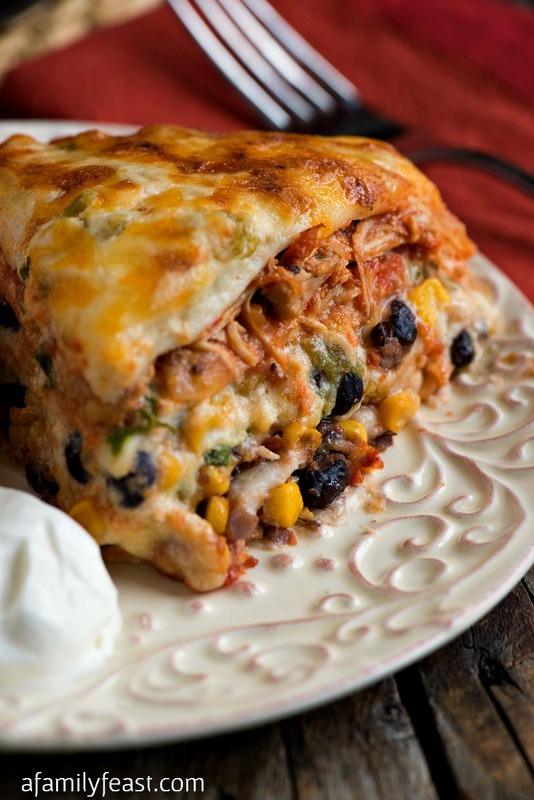 If you are cooking the enchiladas immediately after making the pulled chicken (while it is still hot) you might be able to get by with less cooking time. Just cook until the enchiladas are heated through and the cheese is slightly browned. Hope that helps! Just an update on this meal. I made the pulled chicken recipe as written with the exception that I slow cooked it at 275 degrees in the oven in convection mode. I checked the chicken at 2.5 hours and took a temperature check. It was 160 degrees. I removed it from the oven – and let it sit for about 10 minutes and then shredded it with two forks. I then followed the enchilada as written except I went with 325 degrees in convection mode. Let it cook for 25 minutes and took it out the oven. Results were outstanding! Wife claimed best ever enchiladas…and that says something! 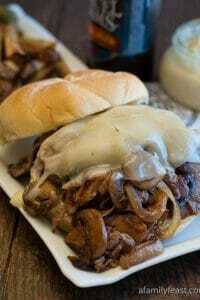 The white sauce rocked with a little help from Frank’s original Hot sauce. Left overs were just as good the next day. Will be making this one again soon! Thanks for writing back Marlen! So glad you (and your wife) enjoyed the recipe! just wanted to let you know that we are making these enchiladas for the third time tonight. It is a sophisticated and modern take on classic enchiladas. Whoever came up with the pulled chicken recipe deserves a medal. Thank you so much! All of the credit for that pulled chicken recipe should go to my husband Jack (I agree – he deserves a medal!). We’re glad you are enjoying the recipes! Thanks for writing to us! Thanks H & C! We’re glad you enjoyed the recipe and thanks for sharing your adaptation! I’d love to make this gluten free. Any idea how much cornstarch I should use in place of the flour? We made this last week and I’ve been craving them since then, so we made them tonight again. Fairly simple, yet delicious! Totally a keeper! Thanks for sharing Martha! I just made this and it was so delicious! I cut the butter and flour qty in half for the sauce. I also used a flour/corn tortilla – the best of both worlds! The results were fantastic! Thank you for your recipes. I’m so glad I stumbled upon your website. Thank you so much! We’re glad you found us too! These were simply awesome. The taste of the Mexican Pulled Chicken was fabulous and the sauce was so authentically Mexican. It was a wonderful dinner. I did use flour tortillas since that is what I had on hand and still fried–they were great. Can’t wait to try some of your other recipes. They all sound do good!!! Thanks so much–Ah, I think I am ready for a nap after that wonderful meal! Thanks Linda! We’re so glad you enjoyed the recipes! Thanks for visiting and writing to us today! If I use flour tortillas will I still need to fry them beforehand? Hi Michelle! The flour tortillas are soft enough that you won’t have to fry them. Thanks! These are AMAZING!! 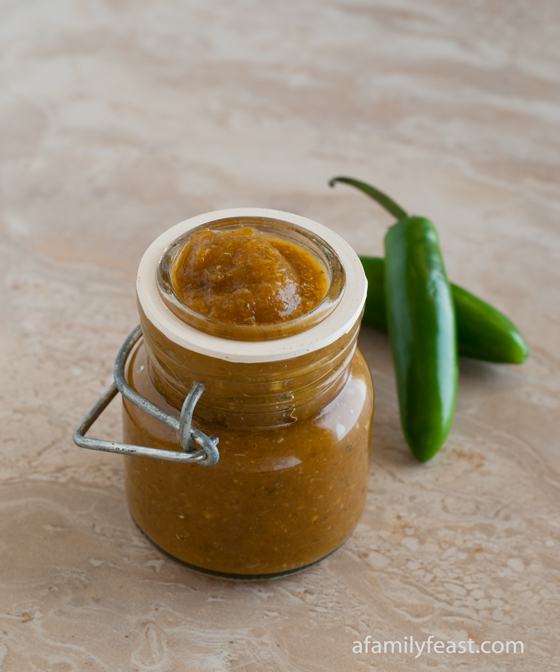 Especially if you have your favorite hot sauce to compliment this recipe. By far my favorite find on Pinterest!! Well this and your Mexican Chicken. I’ll be cooking a lot of your recipes in the future. Thanks Dawn! So glad you enjoyed the recipes! This was awesome! And easy to make! These were excellent! Do you think these will freeze well all prepared or should I freeze the sauce separately? Thanks for a great recipe!